A building’s entrance is always the first point of contact your customer will have with your business, a strong façade with a sleek entrance method can vastly improve the aesthetic value of any building. As with all parts of a building you need to consider some key factors, security, cost implication and service but with your main entrance another key aspect needs to be considered, Design. Creating an aesthetically pleasing, functional entrance plays a vital part in the overall look and feel of a building. Electro’s commitment to quality, precision and innovation makes the company’s products a first choice among architects, specifiers, and designers in the commercial building sector. 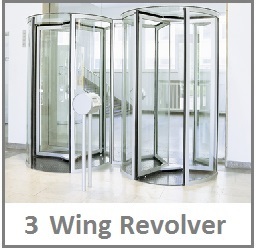 Click below to see more on the Record revolving door options. 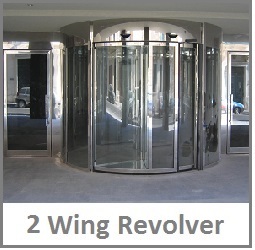 Revolving doors are an ideal solution to airflow regulation at the entrance of a building. The relatively small quadrants of the revolving door minimise air loss reducing air conditioning costs, while increasing the control over pedestrian traffic control into your building. Record, are world leading experts in door automation, specialising in the design of functional and efficient revolving doors that add to the aestehtics of a buildings design. Record, in conjunction with Electro can offer you everyhting you need to create the entrance to your building, not just an entrance. 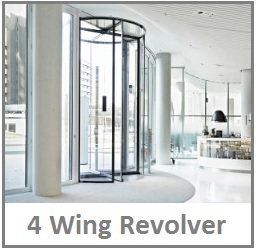 Record revolving doors are technically refined and noiseless in operation. Equipped with two, three or four leaves, with or without a display case and night-shutter, they are available in sizes up to 7500mm in diameter; virtually any combination of features is possible. This very wide range of design options gives planners and architects maximum flexibility in designing their entrances. The drive is fitted into the ceiling or invisibly under the floor, in any RAL colour or anodised finish, The drive can also be fitted on an all glass model. To enable easy access to wheelchair users and walking disabled, Record revolving doors can be fitted with a switchable control to reduce the speed.